Drive our quality reputation into your part of the world. We're confident in the superior performance, outstanding ride quality, excellent fuel efficiency, and high mileage of our tires. After your own test, you will be, too. For over 50 years, Toyo has been a world leader in the development of advanced technology in the design and production of tires. And, as the fifth-largest tire manufacturer in the world, Toyo has an excellent reputation for building high-quality tires at a competitive price. 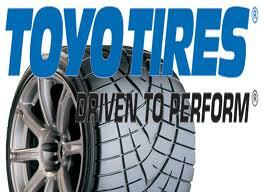 Toyo products include superior performance tires, a great selection of light truck tires, and excellent broadline tires for passenger cars. Now, word is getting out. The same technology that makes Toyo tires perform under the grueling punishment of the track is engineered into every one of our tires. You can be confident that no matter how sudden the stop or sharp the turn, your Toyo tires will let you handle it like a pro. Even before we build a tire and test it at the Toyo test facilities, our engineers examine it using our revolutionary computer analysis. Now, for the first time, changes in the contact area between a moving tire and the road can be simulated and measured moment to moment in variable driving conditions. Those constant changes in contact area are important to you because they ultimately affect a tire's performance. If a tire doesn't pass the computer analysis, it's not going to make it to our test facility - or to your vehicle.